A military strike in Syria doesn’t have to save the people. It just has to hurt Assad. The case for a military strike in Syria. 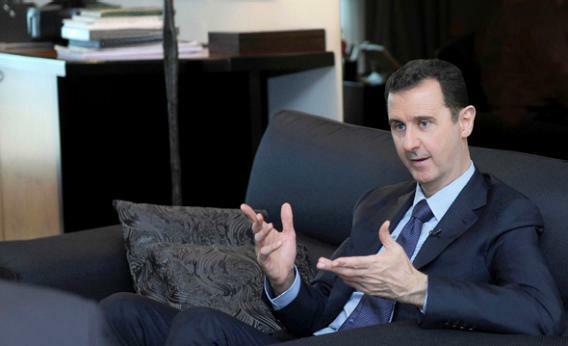 Syrian President Bashar al-Assad in an interview with a Russian newspaper in Damascus, Aug. 26, 2013. Two days ago, President Obama made a case for attacking Syria. Today, Secretary of State John Kerry repeated it. Most of my colleagues think it’s a bad idea. They say an attack won’t fix the mess in Syria and won’t even make things better for the people there. They may be right. But healing the world isn’t the only reason to use force. In many ways, it’s a dangerous reason. It’s what led to our nation-building quagmire in Iraq. The better reason to hit Syria is colder and simpler: If Bashar al-Assad doesn’t pay for gassing his people, he and others are more likely to use weapons of mass destruction again. To discourage that, we have to make him suffer. I’m not going to argue that the evidence presented by the U.S. proves that chemical weapons were used near Damascus last week and that Assad is responsible. You know all about the fallibility of U.S. intelligence in Iraq. Read the Syria evidence for yourself, along with critiques of it, and decide what you think. What I’m going to say here depends on the validity of that evidence. Nor am I arguing for the kind of onslaught that could oust Assad. Obama has already ruled out “direct military engagement, involvement in the civil war.” Like President Clinton in Kosovo, Obama won’t send in ground troops. Like the first President Bush in Kuwait, Obama won’t try to oust the offending dictator or use force to end a civil war. Kerry repeated those pledges today. Impunity is a primitive idea. Kerry and Obama are saying that Assad must be punished. Obama calls it “repercussions,” a “shot across the bow,” a “signal that [Assad] better not do it again.” It’s not about saving Syria, much as we’d all like to do that. It’s about inflicting pain. Pain isn’t a feel-good policy. It doesn’t have the glamor of liberating Iraq or ending the oppression of Afghan girls. But it’s achievable. Its unintended consequences, like its ambitions, are relatively modest. And it’s essential to civilization. If your neighborhood doesn’t have armed police who are willing to kill, thugs will take over. Why should the U.S. be the world’s policeman? It shouldn’t. The United Nations should do it. But as Kerry pointed out, the U.N. doesn’t work: “Because of the guaranteed Russian obstructionism of any action through the U.N. Security Council, the U.N. cannot galvanize the world to act.” The U.N. is a lazy, gutless, corrupt cop that eats doughnuts instead of patrolling the neighborhood. If the Security Council had any backbone, it would have punished Saddam Hussein a decade ago for thwarting U.N. weapons inspectors. Instead, George W. Bush took over the job, turning what should have been a punitive strike into a war of liberation. Nobody wants another Iraq. Iraq is why we don’t trust our intelligence agencies when they tell us Assad used chemical weapons. Iraq is why we dread another invasion. But our mistakes in Iraq also conceal the perils of the road not taken. What would have happened if Saddam’s defiance of the U.N. inspectors had gone unpunished? What would other regimes have concluded about the world’s willingness to police the development and use of weapons of mass destruction? If you don’t want a military strike in Syria, fine. Make your case for sanctions or some other alternative. Whatever you propose doesn’t have to save Assad’s people. But it had better hurt him.